If you’re looking for something extra special to give your loved one this Christmas, why not consider a South West champagne balloon flight with Aerosaurus Balloons? Now is the perfect time to create and purchase this unique, luxury Christmas present. 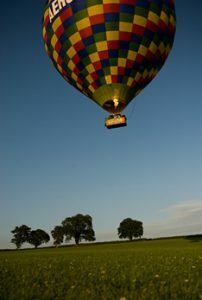 A balloon flight is the ultimate festive treat and one that will leave the recipient totally speechless! Whether you live in Devon, Somerset, Wiltshire, Dorset or Cornwall, this part of the UK is the perfect destination for a beautiful hot air balloon ride. We have flight locations across the region, allowing the recipient to choose where they wish to fly from. Find out why you should book your balloon ride with us below. Christmas is all about celebrating friends, family and festivities and that’s why it’s also the perfect time to show how much your loved ones mean to you. Our balloon flight gift vouchers make for the most romantic and exceptional Christmas presents for anyone and everyone to enjoy. Upon opening the envelope on Christmas Day, expect a reaction of tremendous surprise and happiness as they realise the magical experience which awaits them. It has to be said, Champagne balloon flights provide the ultimate in indulgence high above the clouds, and with our flexible flight availability the recipient is able to choose a sunrise or sunset flight on a day which suits them from our online flight date schedule. There are so many fantastic reasons why hot air balloon rides make for the most memorable gift and you can be rest assured that Aerosaurus Balloons will give them an adventure of a lifetime! Whilst in the air, our expert flight instructors will be able to point out important landmarks across your desired county during your aerial adventure, ensuring you won’t miss a thing. The South West is a perfect location for any balloon flight – all the way from the deep green pastures of Cornwall, up to the panoramic views of Dorset. This scenic landscape has so much to offer. It’s safe to say, wherever you choose to fly from, you’ll be left breathless by the stunning views all around, and the award-winning service which we provide here at Aerosaurus Balloons. Of course, every balloon flight is weather dependent, so you can be assured that when you do fly, the weather conditions will be perfect. How long do your flight vouchers last for, we hear you ask!? 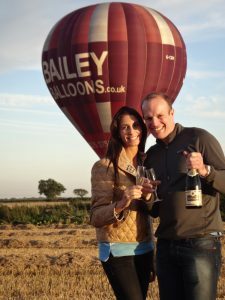 Luckily, all of our champagne balloon flight vouchers listed on our website are valid from any of our flight meeting locations across the region, for up to 12 months from the date purchased. From our Buy Now Pay Later flight voucher to our Anytime Voucher, our open-dated vouchers give you and/or the recipient the chance to pick a date, time and location suitable for them, within the flying season. Christmas is all about showing and gifting the ones around you with the love they deserve, so make sure you get in touch with our friendly team today to order your voucher for the most incredible Christmas gift anyone could hope to receive – they really won’t be disappointed! Alternatively, you can order your gift online on our Flight Vouchers page. Here at Aerosaurus Balloons, we very much look forward to welcoming you on board in the 2019 flying season. In the meantime, we would like to wish you a very warm and happy Christmas!